Vinayaka Chavithi 2018: Ganesh Chaturthi or Vinayaka Chavithi celebrations have begunin full swing.The colourful and spectacular celebrations go back years in time and hold a very significant place in every devotee's heart. Ganesh Chaturthi or Vinayaka Chavithi celebrations have begun in full swing. The 10-day long festival is celebrated with much fervour across states like Maharashtra, Goa, Tamil Nadu and Karnataka. Ganesh Chaturthi or Vinayaka Chaturthi is celebrated in honour of Hindu God, Lord Ganesha, who is said to leave mount Kailasha to be with his followers for these ten days. Devotees clean up their houses and install idols of Lord Ganesha and worship him with flowers and delicious sweets. In states of Maharashtra and Karnataka, you would find massive Ganesh pandals, with artful clay idols of Lord Ganesha. 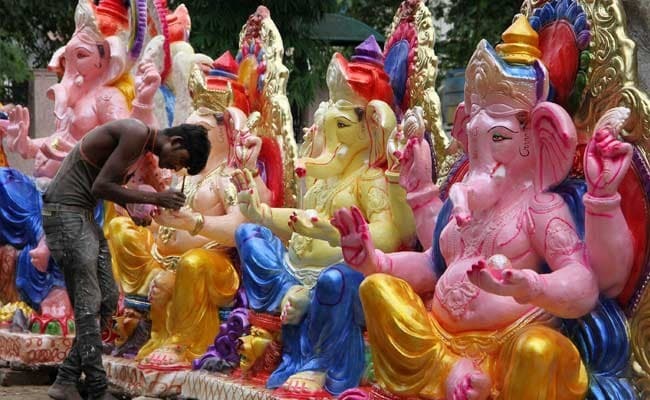 Craftsmen and sculptors from across the country begin sculpting idols of Lord Ganesha months in advance. Post the Ganesh Chaturthi celebrations, these clay idols are immersed in river on the day of Ganesh Visarjan. In the 19th century after public appeal by Indian freedom fighter Lokmanya Tilak, Ganesh Chaturthi celebrations became even bigger and massive. These public gatherings became a means to rebel British authority who were very strict with their laws against large Indian gatherings.Both the welcoming and farewell of Ganesha are accompanied with immense enthusiasm. Devotees sing, dance and revel in folk tunes. During the visarjan, they also throw colours at each other. When is Ganesh Chaturthi 2018? This year Ganesh Chaturthi or Vinayaka Chavithi would begin on 13th September 2018. The colourful and spectacular celebrations go back years in time and hold a very significant place in every devotee's heart. Lord Ganesha's homecoming is celebrated in the month of 'Bhadra,' according to the Hindu Luni-Solar calendar, which typically falls in the months of August or September. Lord Ganesha is known by several names like Ganpati, Vinayak and Vighnaharta. He is one of the most important Gods in the Hindu faith. It is said that no puja is complete if you do not pray to Lord Ganesha at the very beginning of it. Lord Ganesha was the second son of Lord Shiva and Goddess Paravati. According to the legends, Goddess Parvati created Ganesha and told him to guard her door while she finishes her bath. When Lord Shiva returned and found this little boy who would not let him go past the gate he was livid. He pursued Ganesha but he was unwilling to budge. Little Ganesha even called for a combat. Angry Lord Shiva severed the head of Ganesha after a combat between the two. Upon seeing the dead body of little Ganesha, Goddess Parvati broke down and asked Lord Shiva to do something to bring their son back to life again. Lord Shiva ordered other devas to head to the north direction and bring the head of whoever they find first. They found an elephant and as instructed by Lord Shiva, brought its head. Lord Shiva fixed the elephant's head on the child and brought him back to life. Lord Ganesha is designated as vighnaharta, the one who averts obstacles. Through the span of Ganesh Chaturthi, devotees pray to Lord Ganesha to rid them of all their obstacles in their personal and professional lives. 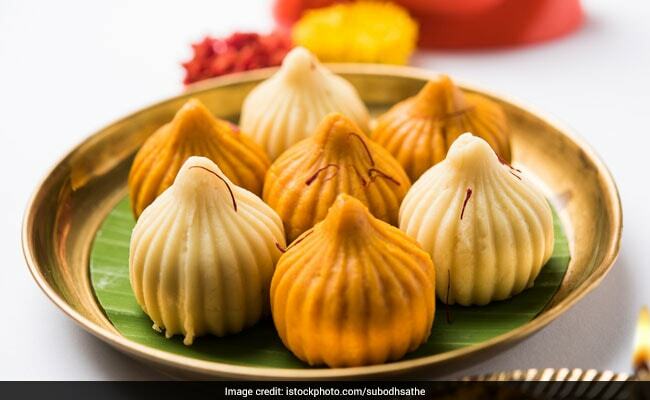 It is no strange fact that Lord Ganesha was a fond lover of food, especially modak. Modak is a special kind of sweet rice flower dumpling made with fillings of jaggery and desiccated coconut. Sweetmeat shops across Maharashtra are filled with delicious varieties of modaks during this time. Another popular sweet dish is karanji (karjikai in Kannada), similar to modak in composition and taste but in a semi-circular shape. This sweet is popularly known as nevri in Goa, which is an intrinsic part of Ganesh Chaturthi celebrations in Goa. In Andhra Pradesh and Telangana modak, ladoo, vundrallu panakam (a jaggery-, black pepper- and cardamom-flavoured drink), vadapappu (soaked moong lentils) and chalividi (a cooked rice flour and jaggery mixture) are offered to Lord Ganesha as part of naivedya, an assortment of sweets. Here's wishing you all a very Happy Ganesh Chaturthi 2018!